Aliamén is another modern charanga from outside of Havana, in this case, Santa Clara. 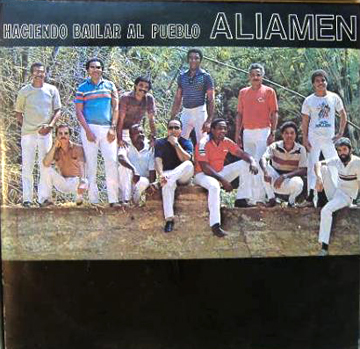 The name of the group is known to timba fans as the former group of (now ex-) Manolito singer Sixto "El Indio" Llorente, but it's well worth listening to on its own merits. Here's a great interview with founding timbalero Tony Alba which fills in many of the details of the early years. It was apparently in 1968 that Ernesto Ramos joined the band as pianist and arranger, the other principal arranger being cellist and leader Tomás Múñoz. The group has a definite cult following and played some legendary live concerts in the mid-80s attended by witnesses who still rave about them to this day. They're one of the least reissued of the top Cuban bands. We're desperately looking for information on the gap between the 1980 and 1989 albums shown.